It’s May 1, which means two things. It’s time to watch Rick Jeanneret lose his mind. And it’s time to start exploring trades in your fantasy league. This week, we’ll look at three players you could consider trading, and how you should sell them to others in your league. Don’t take this as a sign that you should panic on these three players in particular. They’re simply examples of different types of sell opportunities. Still, if you own one or more of these three (or players like them), here are some suggestions for how to proceed. It’s ugly, my friends. If you own Pujols, you either invested a first-round pick on him (maybe even no. 1 overall) or paid $40-plus in an auction. For your investment, you’ve gotten .217/.265/.304, zero homers and four RBIs. He’s striking out more than ever before and walking less than ever before. He’s been stymied by aces like David Price and journeymen like Bruce Chen. There are no indications he’s injured, or that anything major has changed since he hit .321/.386/.620 from June 2 to season’s end in 2011. Nothing’s changed, that is, except he’s now hitting like vintage Doug Flynn. Still, very few people actually believe Pujols is done, within the game or in your fantasy league. If anything, there’s a good chance you’ve fielded some buy-low feelers from leaguemates hoping you’ll panic. The trick is to find a happy medium between a rival owner thinking he’s landed a potential bargain, and you getting the right deal, while hedging slightly against the small possibility that Pujols will struggle badly all year. The best-case scenario is to find a player with similar skills, even one at the same position, who went just a little later on draft day. If said player is off to a relatively slow start himself, that could expedite things. We tell ourselves that we’re emotion-free, that we can recognize buy-low and sell-high opportunities and not let early results cloud our judgment. But you’re probably not getting Josh Hamilton for Pujols, never mind Hamilton’s injury history or the idea that his base skills haven’t changed at all, save for a .403 batting average on balls in play and a couple more balls clearing the wall than usual in April. So how about Joey Votto, his .289 average and two homers? Adrian Gonzalez at .284 with two homers? Prince Fielder cooling off after a hot start, now sitting on three homers and 11 RBI? If that doesn’t work, and you’re in a deep league, pursuing a 2-for-1 or 3-for-1 deal might make sense. Normally the hallmark of a good fantasy trade is to land the best player. But in an NL-only, AL-only, or deep mixed league, simply finding competent everyday players at every position can be a challenge. By dealing Pujols for three solid players, you’re spreading your risk around, rather than sinking or swimming with one big name. Pujols for, say, Matt Garza, Jason Kipnis, and Miguel Montero? Feel free to sub in your own names. The key is to make sure you’re getting enough. You can call it 95 cents on the dollar, maybe 90 cents. Just as long as you feel comfortable with the return. 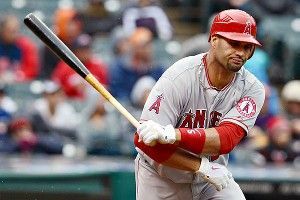 Why should you trade Pujols if the odds suggest he’ll start hitting soon, and then likely over the next five months? Beyond whatever downside risk might exist in holding him, there’s also that emotional element to it. Say you own five stocks in your portfolio. Two are performing reasonably well, one’s about even, one’s through the roof. The other is a total dog. There’s an excellent chance you’re going to focus on the dog. You can get consumed with fear of big losses, yet we can’t bring ourselves to sell either, for fear that we’ll miss the bounce-back. The stakes might not be as high with your fantasy team as with your retirement fund, kids’ college fund, or even the $1,000 you scraped together to start trading. But watching Pujols fail four times a game, night in and night out, could affect your ability to make shrewd waiver-wire claims, make trades using other players, or just generally manage your team. Trading Pujols to avoid irrational decisions and establish peace of mind is a perfectly viable strategy. Again, so long as the return is reasonable. Your basic sell-high guy. Only if you play in a league with savvy owners, they probably know that a 0.90 ERA isn’t sustainable when you’re striking out just five-plus batters per game, rising a .214 BABIP, allowing home runs on just 4.3 percent of fly balls, or stranding nearly 90 percent of the runners you put on base. Actually they don’t need to know about any of those fancy stats. They just have to know that it’s Joe Freaking Saunders. I’m not sure we can completely discount the allure of flashy numbers, though. Intellectually, people get that an eight-year veteran with a career 4.06 ERA isn’t going to break Bob Gibson’s single-season run-prevention record. But in the right context, you might be able to sell a player like this (whether Saunders specifically or another established veteran who’s off to a huge start) for a favorable price. For instance, Max Scherzer owns a 7.77 ERA. In his last start against the Yankees, the Tigers righty allowed seven hits and seven walks in 4⅔ innings. It’s gotten so bad that Jim Leyland can barely hide his disgust, and using Scherzer’s last remaining option to send him to Triple-A for repairs isn’t out of the question. But Scherzer’s been through these horrific stretches before only to later recover, he’s still striking out 10 batters per nine innings, and his price might never be lower than it is now. No matter how confident your leaguemate is that Saunders will get worse (how can he not?) and Scherzer will get better (how can he not? ), when one pitcher’s allowing nearly seven more runs than the other, you can’t help but notice. If you’re not a Scherzer fan, pick another pitcher off to a terrible start, maybe even a pitcher with a much brighter pedigree. There’s no way in hell you’re getting Yovani Gallardo for Saunders, despite Gallardo’s 6.08 ERA. But it might be easier to pull off a Saunders-and-X or Saunders-X-and-X for Gallardo deal now than it’ll ever be. What you’re doing is playing a game of obfuscation. You want your rival focusing on how awful a Scherzer or Gallardo has been, or how acquiring two or three players for one could help him patch some holes. He knows all about Joe Saunders’s pedestrian track record. But if there are enough moving parts in the deal or perceived albatrosses for the other guy to dump on you, you might be able to bank a profit on Saunders, or whoever your unsustainable April fluke might be. There’s nothing more tantalizing in a fantasy league than upside. Sure, Harper hit just .250/.333/.375 at Triple-A this year, .256/.329/.395 at Double-A last year, and is just 19 years old. He’s also a no. 1 overall pick and a supposed can’t-miss prospect. He’s got a golden opportunity to prove himself and stick with the team, given the injury to Mike Morse and the Nats’ general lack of viable starting outfielders. Right now all we’ve got are two games in which Harper’s gone 2-for-6 and hit the ball hard a few times. The sky, for right now, is the limit. That’s how you should market him. Do it fast, too. While it’s certainly possible that Harper could raise his market value by hitting a bunch of homers in the next week or two, there’s a lot to be said for the power of imagination. Forget what he has done. Make your leaguemates focus on what he could do. Who do you want in return? If you’re a strong contender in a non-keeper league, there’s a lot to be said for simply getting a more reliable, veteran commodity. Could you get Torii Hunter for Harper? Maybe even Harper’s teammate Jayson Werth? If that kind of challenge trade isn’t something you can sell, a multi-player deal could work. Harper not enough upside to do a deal? What if you offered a package of multiple players that includes Harper and say, Aroldis Chapman (the poster child for upside without elite production, in this case due more to role than youth)? Couldn’t that kind of package land you one or more steady, able players who can help you win your league, especially a deeper league? You’re trading in a lottery ticket for annuities. One’s a lot sexier, the other’s far more likely to deliver at least some positive value. As much as Harper represents massive potential right now, he also brings the risk of lousy stats dragging down your team, demotion back to the minors, or both. If someone’s ready to offer a boring but useful player for the long shot who could pay off if everything breaks right, make the deal. In many ways, you’re better off with Harper (or a player like Harper) on someone else’s team, rather than your own. Got a fantasy baseball question, query, or quandary? E-mail us at grantlandfantasy@gmail.com.